If there is any area I know too well it is rejection, rejection from friends and in relationhips. When rejection took place I never knew how to handle it, I lost myself in the negativity and pain of others, I would think I was not good enough based off of the treatment I received from others. But later on when I let God in, I realised and learnt that I cannot control the actions of others, neither can I change people and definately cant expect them to treat me good based on me treating them good. On one occasssion I faced rejection which really took a lot out of me, was when I was cheated on countless times and dumped, faced many things, put to the side and then asked to be the side chick. Because I did not know myself worth, I allowed a lot which should have avoided, walked away from and prayed over. But being that I was naive and weaker in my walk back then a lot of what I experienced at times was self inflicted because what I was entertaining was what God would have saved me from. But thanks be to God and His grace and mercy for delivering me and setting me free from all that I endured. You have to be very careful to not let imperfect people who are not sure of themselves define and put you down you have to come to an understanding of who you are and whose you are. Or else you will allow many things to stagnate you in mess. When rejected and you question yourself, you entertain a low sense of self, you lose yourself, you dont know your identity, you water down your capabilities and on top of that you accept lower than you deserve because you always use the yardstick of man to move by and so by doing that, you cannot progress to do and be better. You will forever be bound to the toxic thoughts of men and their ways. But the moment you break out and break free and use Christ as your standard you will surpass all the negativity and traps and be in the positon where God wants you to be and that alone is all that matters. God loves us, He calls us His own, we are cherished, beautiful, a royal priesthood and able to do great and mighty things once we believe this and know who we are. Step out and be bold you may be rejected by man, but not by God. 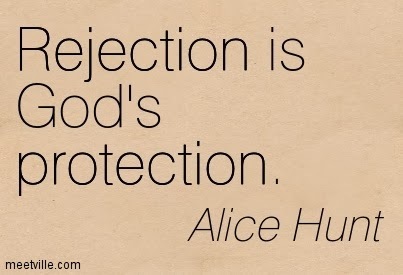 REJECTION IS ALWAYS A REDIRECTION TO WHAT GOD HAS IN STORE FOR YOU. NEVER SEE IT AS A BAD THING, THOUGH EASIER SAID THAN DONE. DONT LET IT KEEP YOU DOWN. BUT RATHER RISE UP AND GIVE ALL TO GOD, LET HIM USE THE PIECES TO MAKE A BEAUTIFUL MASTERPIECE. Be encouraged and know that your past doesnt define you, it rather teaches you and helps to build you up to learn, grow and be positioned to where God wants to allign you to operate from. I pray this blessed and encouraged you in some way. Loving you in prayer.